Generally speaking, there are 3 layers, which every hair is made up of. The cuticle is an outside layer. It is flat and thin. The cortex, or the middle layer, is the main part of the hair. It is usually thick and firm. The medulla is a inner layer that goes thinly through the middle of the hair. Let’s have a look at all three layers in more detail. Cuticle. 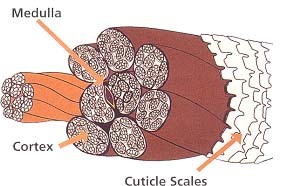 The cuticle is commonly comprised of overlapping scales of about ten layers. These scales are just like tiles of a roof and their edges all lying away from your head. These scales are semitransparent and, thus, we can see the hair color through them. If they are intact and folded closely, the hair will look very healthy, lustrous and shiny (just like glass). But if the scales have been unfolded and broken and harmful substances have been absorbed into the cortex, the hair will appear rough, fragile and lifeless. Cortex. As we have already said, this is the main part of the hair that is placed under the cuticle. The cortex is comprised of fibres or strands that are toughly intertissued together. They are rather flexible and can be significantly stretched and return to the original length with no adverse consequences. The color of hair is defined by melanin and pheomelanin, the main color pigments that are placed in the cortex. Speaking precisely of the cortex structure, it is made of keratin, a protein that itself is comprised of amino acid units. These units are arranged in polypeptide chains that are long and coiled. The coils of polypeptide chains are held together by two main types of bonds. They are the temporary bonds that can be easily broken and rejoined and the permanent bonds (also known as disulphide bonds), which are very tough and can be broken only by strong chemical substances. Medulla. It is the most inner layer of the hair shaft, though, it’s function is not absolutely clear yet. Sometimes this layer is even absent in some types of hair.